The Design Diversity Index (DDI) is intended to track data that corresponds to the Design Journey framework, which includes four sequential passages. The current version of the Index only targets data from the two middle passages: (2) Proficiency and (3) Workforce. The Proficiency passage comprises internships, undergraduate, and graduate education. Academic Program Data in the Index tracks undergraduate and graduate students in this critical design journey passage. The Workforce passage begins after college graduation and extends to a designer’s mid-career. The Future versions of the DDI may expand to track data for the earlier Foundations passage (high school and after-school programs) and latter Influence passage (faculty appointments and senior leadership positions), but the project currently begins tracking data in undergraduate design programs. 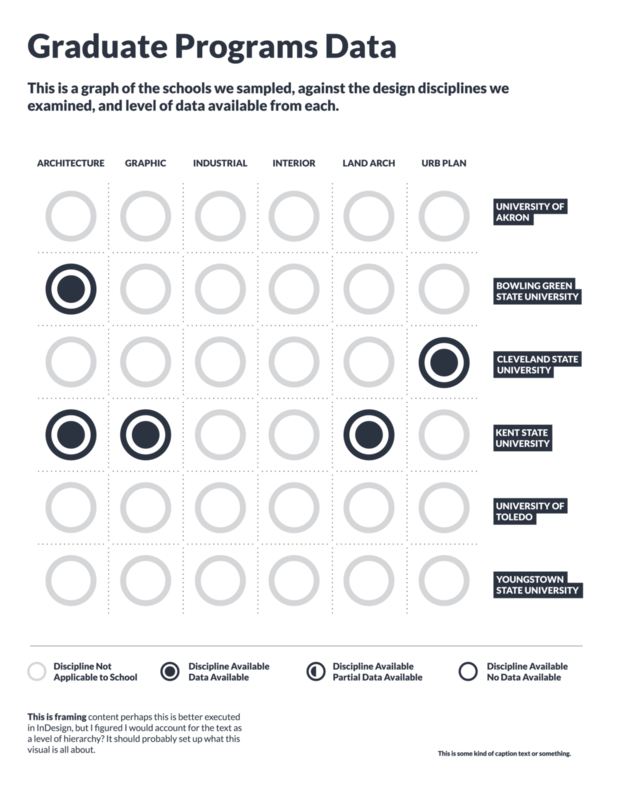 Design Diversity Index includes data from six public universities in northern Ohio with undergraduate or graduate design programs: Kent State University, Bowling Green State University, University of Akron, Cleveland State University, Youngstown State University, and University of Toledo. The university profiles below present demographic data from each institution's design programs compared to the total student population. 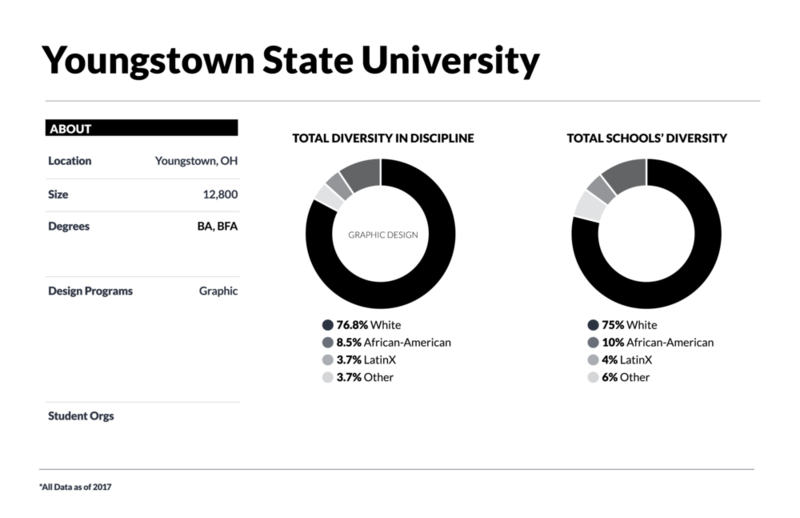 The following bar graphs present the demographic breakdown of students in architecture, graphic design, interior design, landscape architecture, and urban planning. The data include undergraduate and graduate programs at public universities in Northern Ohio. Information on industrial design will be added when more private schools, community colleges, and academic institutions in central and southern Ohio are added to the Index. The percentage of African American students in KSU’s architecture program is significantly lower than the percentage of African American students in the university’s total population. 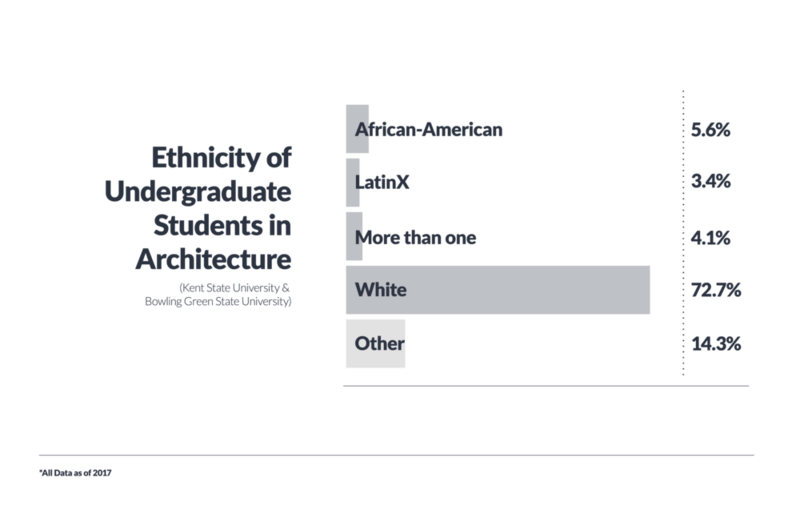 But both KSU's undergraduate and graduate architecture programs achieve relatively equitable percentages of Latinx students. The percentage of African American students in BGSU’s architecture program is only 2.1% lower than the percentage of African American students in the overall university population. This relatively close relationship between design program and university-wide population may offer insights for increasing African American student enrollment at other architecture programs in the state. Latinx students are well-represented in undergraduate graphic design programs, but not represented at all in the graduate graphic design program. Advancement to graduate education could be an effective first action to increase Latinx representation in senior positions and faculty in graphic design. The significant difference between the percentages of Latinx students in BGSU's two graphic design programs may provide meaningful reasons for Latinx presence in other academic programs. Unique among other programs, CSU's percentage of African Americans in the graphic design program (20%) is higher than the percentage of African American students in the total university population (17%). The low percentage of African American students in the interior design programs at both UA and KSU provokes questions about the lack of representation in the field, overall. The single landscape architecture program in Northern Ohio is only four years old, providing an opportunity to incorporate successful strategies from the start to attract people of color. Although CSU has the highest percentage of African American students among the other public universities in Northern Ohio, the percentage of African American students in CSU’s Urban Planning program is one of the lowest across all the design disciplines in the study. Lessons from CSU's graphic design program or other academic institutions may offer ideas for increasing African American representation over time.